HOGG – February 8, 2019 (suddenly), Alfred Richard Havelock (Alfie), much loved husband of the late May, Aughrim House, Magherafelt, dearly loved father of Irene, Barbara and Albert, dear father-in-law of Michael, Ivor and Caroline, loving grandfather of Jennifer, Clare, James, Alice, Steven and Siân and dearest brother of John. Service of committal in Tamlaght O’Crilly Parish Churchyard, Sunday February 10 at 3:00pm. Family flowers only please. 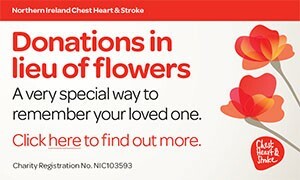 Donations in lieu, if desired, for NI Chest, Heart and Stroke, payable to Garvin’s Funeral Service (Donations A/c), 15 Ballyronan Road, Magherafelt, BT45 6BP. Will always be remembered and loved by his Children and the entire Family Circle. I am sorry to tell you that Alfie Hogg has passed away.